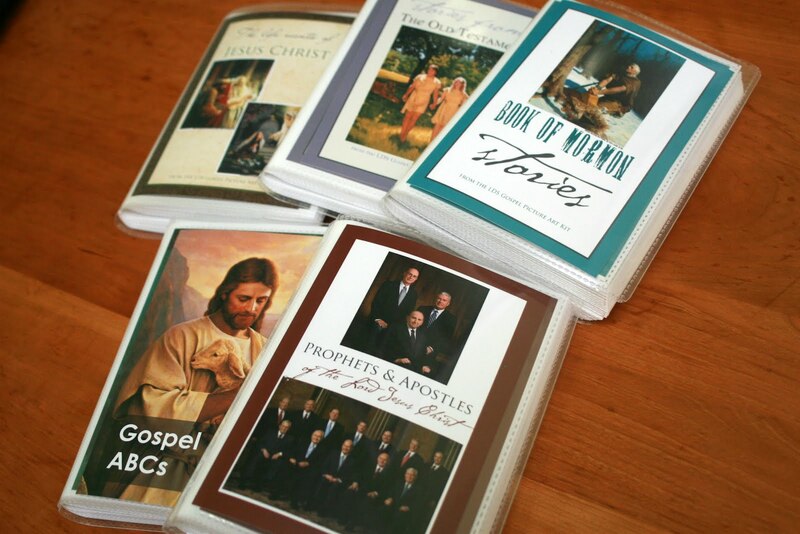 I did a compilation of 10 different sets of church quiet books but combined them because I could fit more than one in each photo book which holds 48 pages. The Life of Christ, pictures need to be added. Old Testament, pictures need to be added. Book of Mormon, pictures need to be added. Gospel ABCs, ready to download and print. Prophets and Apostles, pictures need to be added. Primary Themes, and Songs, ready to download and print. The Articles of Faith are all ready to be printed. We Believe, needs a few pictures added. Teachings of Christ, pictures need to be added. Bright Ideas from the friend, ready to download and print. They were all relatively easy to do. The ones you have to add pictures to, you add them,I used ipiccy.com, save it and then sent to Costco or wherever to print, as you would with any picture (they are all 4×5). Then the ones that are already done you just send to print as you would a photo. Get a photo book from the dollar store and your ready to go. If you can’t find them at the dollar store you can find them on Amazon by clicking here. Here are some more that I’ve found! And a really fun way to make church quiet books just using pictures and activities from the friend by The Craft Patch Blog. I’ve done something simiar for each of my boys and they have LOVED it! Another favorite place I love and have purchased a bunch of file folder activities for my boys is over at Green Jello with Carrots where you can purchase other games and activities. Also, I'm downloading the books from Simply Fresh Designs right now, and is the CTR book the one you didn't have the link to? I think it's this one. SO smart. I have seen some great photo printing deals lately… I'll have to whip some of these up (er… whip up some of our own pictures to add 🙂 and take advantage! Thanks for sharing! It takes a good amount of time to insert the pictures – I can only imagine the time it took for you to put these all together from scratch! Thank you so much. I can't wait for my kids to enjoy these! I truly appreciate you posting these. Thank you! For some reason I can't get the Gospel ABCs to work, am I the only one having problems with that one? All the others work great. Thank you for sharing your time and talent with all of us. Dana, when you click on the Gospel ABC's and it takes you to the Trying To Be Important sight that says there is an error, look on the right hand side of the page under Popular Posts and you'll see the link to the Gospel ABC's. Unfortunately, it basically says she had to take it down because the Church changed some of their policies about redistributing artwork. I'm wondering where you bought the picture albums? I have a hard time finding albums that the front cover is a picture slot (vs a hardish colored plastic cover). Try your local dollar store. Ours has a ton of plastic albums, and the covers are printed cardboard inserts that you can slide out and replace with a picture. Hope it helps and good luck! I would love the gospel ABC's, but when I try to open it, it shows an error message. Can you email it to me? Also, can you email the BOM stories with the pictures already in them, or is that possible? Thanks so much! (Trying to make a quick gift today if possible).